Kellogg's Fun To Get Nourishment Ad 1957 This is an April 15, 1957 advertisement. It is a nice color ad from Kellogg's Rice Krispies. 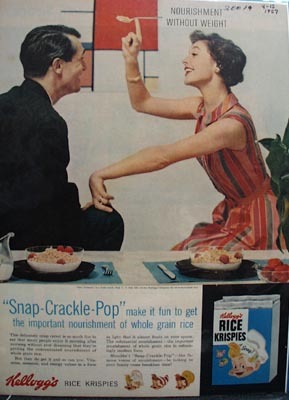 Pictures a couple about to enjoy a bowl of Rice Krispies but now she is balancing a spoon of rice krispies on her index finger. In mint condition. Photo is taken through plastic and may show wrinkles or crookedness that is not in the ad. This magazine tear sheet measures 10 a/4"" wide by 14"" tall. Items Similar To "Kellogg's Fun To Get Nourishment Ad 1957"